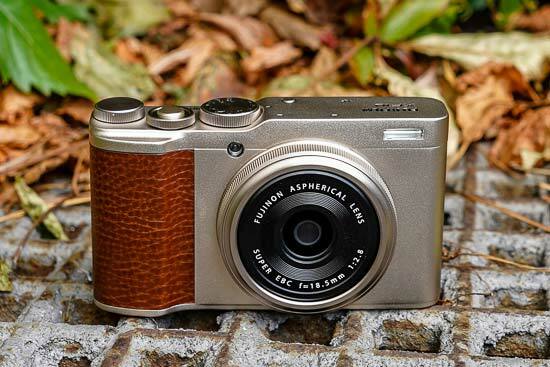 The Fujifilm XF10 is a premium compact camera with a 24.2 megapixel APS-C sensor, ISO range of 200-12800 (extendable to 100-51200), fixed 28mm f/2.8 lens, 3-inch touchscreen LCD, Bluetooth and Wi-fi connectivity, 4K video recording at 15fps, 4K burst shooting mode, 11 Fujifilm Film Simulations and 19 Advanced Filters, 1:1 Square Mode, dual control dials, lens control ring and a thumb-operated joystick, all in a body that weighs just 280g and can fit inside a coat pocket. 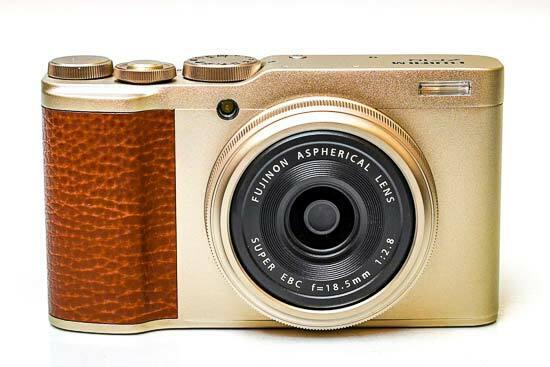 The Fujifilm XF10 is available now in Champagne Gold or Black priced at £449 / $499. 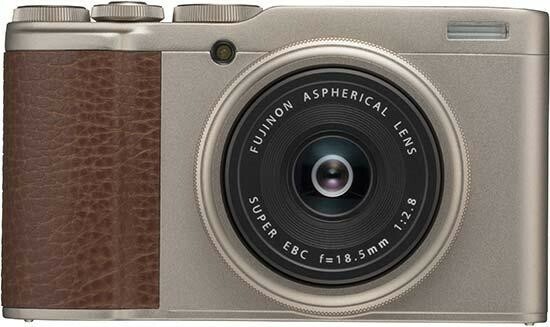 The Fujifilm XF10 is the spiritual successor to the Fujifilm X70 camera from 2016, which also sported a large APS-C sensor and 28mm fixed lens in a compact body. Indeed, the XF10 actually inherits exactly the same 18.5mm f/2.8 Fujinon lens that the X70 employed, now pairing it with a 24 megapixel Bayer CMOS sensor that's the same as the one found in the X-T100 and X-A5 mirrorless cameras, with the same no-name image processor on-board too. Fujifilm have ditched the X70's articulated screen and flash hotshoe in order to make the XF10 even smaller, so that it now rivals the popular Ricoh GR in size and weight. These are the only two cameras currently available that combine such a large sensor with such a compact body. 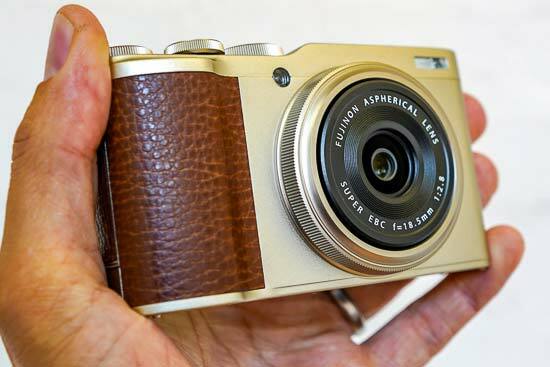 Unlike the X70, which launched with a number of optional accessories including an optical viewfinder, lens hood, wide conversion lens and case, the XF10 is devoid of any official add-ons, save the rather poor quality clip-on lens cover and much better leather wrist-strap that ships in the box. Subsequently there's no way to fit a viewfinder to the XF10, making it entirely an at arms' length shooting experience, which may well suit people upgrading from a smartphone, but probably won't best please enthusiast photographers. On the other hand, the XF10 is a very customisable camera considering its "budget" price-point, with not one but two control dials plus a lens control ring, all of which can be customised to suit your particular way of shooting. Throw in a dedicated shooting mode dial, customisable rear Function button and the thumb-operated AF joystick, and it's certainly possible to setup the XF10 to operate like a much more advanced camera. 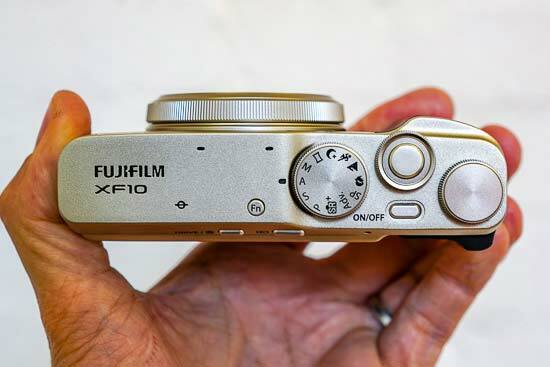 The Fujifilm XF10 is fairly well-built, in spite of its all-plastic construction, with little discernible flex or movement in its chassis. 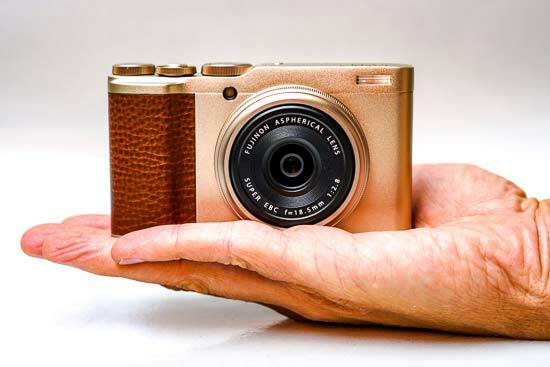 It's by far the smallest and lightest APS-C sensor camera in the Fujifilm range, weighing in at just 280g with the NP-95 battery and memory card fitted and measuring 112.5 (W) mm x 64.4 (H) mm x 41.0 (D) mm, making it well-suited to being slipped into a coat/jacket pocket. The XF10 has a fixed 28mm-equivalent lens with a fast maximum aperture of f/2.8. In combination with the extensive ISO range of 200-12800, the lens' 9-blade aperture and the large APS-C sensor, this makes it easy to throw the background out of focus and achieve some lovely bokeh effects. The XF10 is well suited to low-light shooting, allowing you to hand-hold the camera in places where you'd usually be reaching for a tripod (if allowed) or other support. Note that this camera does not feature built-in optical image stabilisation, although we didn't miss it too much due to the short focal length. The XF10 utilises a leaf-shutter rather than the focal-plane shutter that DSLR cameras have. This is a small circular shutter that's built into the lens itself, the chief benefit being near-silent operation. To make the camera even less obtrusive, there's a Sound & Flash menu option which enables you to turn off the speaker, flash, AF-assist lamp and most importantly the artificially-created shutter-release sound, instantly making the XF10 perfectly suited to more candid photography. The mechanical shutter has a top speed limit of 1/4,000th second, which means that we ran into some over-exposure issues in bright sunlight when shooting in aperture and shutter priority modes wide-open at f/2.8. The XF10 doesn't feature a built-in Neutral Density filter, so you'll have to either stop-down the aperture and sacrifice some depth-of-field to avoid blowing out the highlights, or switch to the electronic shutter, which provides a much faster top shutter speed of 1/16,000th second. At the heart of the XF10 is a 24.2-megapixel APS-C sized CMOS sensor. APS-C is a size that's more commonly used by DSLR or mirrorless cameras than by your average compact, being about 10x bigger than those found in most compacts and 15x larger than those in smartphones. It promises to deliver image quality that's at least on par with much bigger cameras, and as our test photos and sample images show on the next two pages, the XF10 can certainly live up to that promise. You can set the aperture, shutter speed and ISO during recording, and you can also set the Film Simulation mode, so black and white footage is possible. Continuous auto-focusing is possible, and you can manually focus too, which encourages some more creative effects. There is a 2.5mm stereo mic jack and a HDMI port for connecting the X100T to a high-definition TV, although as usual there's no cable supplied in the box. The XF10 is the latest X-series camera to feature touchscreen control. The Touch Screen Mode menu option offers 4 choices - Off, Touch Shooting, AF and Area. Touch Shooting sets the focus and takes the picture with one touch of the screen, AF chooses the focus area and activates the auo-focus, while Area just selects the focus area (our preferred option). In addition, during playback you can swipe, drag, pinch in/out, and double-tap to review your images, although rather annoyingly you can't control the menu system. There's a fairly generously sized hand-grip at the front of the X70 that's coated in a faux leatherette material, and a prominent rubber thumb-rest on the rear. One small metal eyelet on the side of the body is used for connecting the supplied wrist strap. A metal tripod mount is positioned off-centre from the lens towards the shared memory card / battery compartment, so annoyingly you do have to remove the camera from the tripod to change either of them. The XF10 has a fast hybrid AF system with both a conventional contrast-detection system and built-in Phase Detection pixels. There's a 35-point Single Point mode for high speed and precision focusing, and Zone and Wide/Tracking modes that use a larger 91-point area to capture moving subjects. 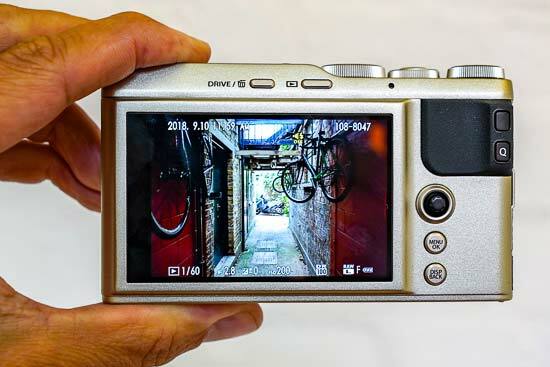 The Fujifilm XF10 only offers way of composing your images, using the high-resolution 3-inch LCD monitor on the back, which has 1,040k dots and offers 100% scene coverage. The LCD screen has a handy Info view which presents all of the key settings at once, or you can switch to the Standard or Custom Live View modes, with the latter offering 14 customisable options. The completely configurable Quick View screen, opened via the Q button on the rear, provides quick access to 16 frequently used shooting settings including the ISO speed, White Balance, File Size and File Quality, with the AF joystick and rear command dial used to quickly change them. The XF10 features enhanced built-in wi-fi connectivity. Install the FUJIFILM Camera Remote App and you can transfer your pictures immediately to a smartphone or tablet PC and then edit and share them as you wish, transfer stills and video onto the camera, and embed GPS information in your shots from your smartphone. You can also control the camera remotely, with the list of available functions including Touch AF, shutter release for stills and movies, shutter speed, aperture, exposure compensation, ISO sensitivity, Film Simulation modes, White Balance, macro, timer and flash. The built-in wi-fi also provides a simple means to backup your photos to your home PC. Additionally, the XF10 can be connected to your smartphone via Bluetooth. This has the advantage that the camera and smartphone will automatically connect with each other (if Bluetooth is enabled on both) when the Camera Remote app is opened, a process that only takes about 5 seconds. If you enable "Auto Image Transfer On", the latest batch of images will be automatically transferred to your smartphone.